I remember the time when nothing but Herbal Essences dominated my bathroom shelf in terms of haircare products. The products always smelled lovely and left my hair feeling so clean and fresh, until they decided to change their whole formula. 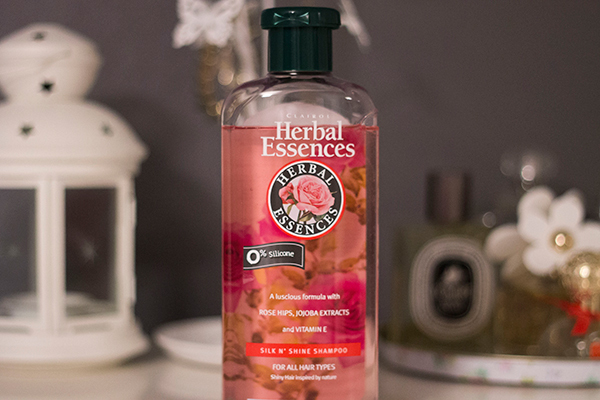 To me, the newer Herbal Essences never quite compared and I ventured elsewhere to find a better alternative. If you share my sadness over the change, fear not as Herbal Essences have brought back their original formulas for a limited time only. If there’s ever a time to stock up, it’s now or never! Herbal Essences has brought back 4 products from their original collections: Sensuously Smooth, Shimmering Colour, Silk n’ Shine and Moisture Balance so there’s pretty much something for everyone. At the moment I only own Silk n’ Shine but I'll definitely be picking up the rest very soon. Silk n’ Shine is for all hair types to bring a little shine back into your hair. It’s made with rose hips, jojoba extracts and vitamin E so it’s very nourishing to the hair and has that lovely floral scent we all know and love. It comes in the same original packaging so you'll be able to identify it against the newer bottles and the formula is exactly how I remember it to be. One thing which might be new is that it contains 0% silicone which is a great addition to the original formula as I’m not sure if it originally had silicones or not. If you were a fan of the original formula, definitely pick this up while you can. I'm sad that my all time favourite Rainforest Flowers wasn’t in the collection but Sensuously Smooth does have very similar ingredients so I'm hoping it’s just being used under a different name. At the moment they're also half price at Boots so if there’s ever a time to stock up, it’s now! EDIT: One of our lovely readers pointed out that this product does contain a high level of sulphates, which can dry out your hair with overuse so I just wanted to make you aware of it, should you plan to purchase. I'd suggest using a more nourishing shampoo in between using it. Personally I haven't had any problems with this range in the past or present but if you have a much drier hair type, make sure you use with caution.